To save some space on your data store disk, you can set a special rule which deletes all messages older than a specified number of days. You can configure the items clean-out for individual users or per domain. If both are configured, settings per user are applied. Kerio Connect performs the clean-out periodically based on the size of your message store. If you do not want to lose any messages with the clean-out, archive or backup your data store. In the administration interface, go to the Configuration > Domains section. On the Messages tab, select folders for automatic clean-out and set the number of days. By default, new users inherit settings from their domain. In the administration interface, go to the Accounts > Users section. In the Items clean-out section section, select the Use custom settings for this user option. Select folders for automatic clean-out and set the number of days. If users accidentally delete a message, you can enable items recovery and recover the deleted items before they are cleared-out. Double-click the domain and go to the Messages tab. Select the Keep deleted items for option. Specify the number of days for which the items will be available after deletion. 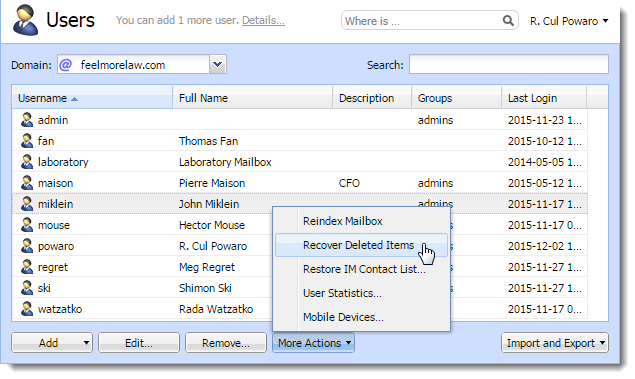 Select the user and click on More Actions > Recover Deleted Items. Click Close to close the result of the process. Users find the recovered items in their Trash folder. If both are configured, settings per user are applied. You can also use server filters. For more information refer to Filtering messages on the server. Double-click the domain and switch to the Messages tab. Select the Limit outgoing message size to option. Specify the maximum size of the outgoing messages for this domain. Double-click the user for whom you want to limit the message size. On the Messages tab in the Maximum message size section, select the Use custom settings for this user option. Specify the limit for outgoing messages for the user. Select Do not limit message size to disable any limits. Each new message composed in Kerio Connect Client is sent to Kerio Connect via HTTP POST requests. Each request contains the message body, all headers and attachments. You can limit the size of the HTTP POST request (this also limits the message size). In the administration interface, go to Configuration > Advanced Options > the Kerio Connect Client tab. 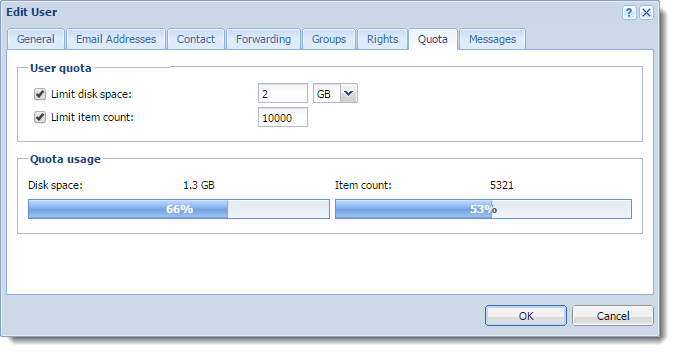 Specify the maximum size of outgoing messages. Restart Kerio Connect. For more information refer to Installing Kerio Connect. In the administration interface, go to Configuration > SMT server > the Security Options tab. Select the Limit maximum incoming SMTPSimple Mail Transport Protocol - An internet standard used for email transmission across IP networks. message size to option. Specify the maximum size of incoming messages. You can also use server filters. For more information refer to Filtering messages on the server. Apart from limiting the size of messages, you can also set a limit to the users' mailbox and the number of items they contain. Double-click the user and switch to the Quota tab. To limit the size of the user's mailbox, select Limit disk space and specify the size. To limit the number of items in the user's mailbox, select Limit item count and specify the number of items. Users may be notified if the quota of their message store reaches a certain limit. Thus users may delete messages in their mailboxes. In the administration interface, go to Configuration > Advanced Options > the Store Directory tab.